Hell Fest was directed by the guy (Gregory Plotkin) that directed the worst Paranormal Activity and edited Get Out and Happy Death Day — what a weird catalog. He edits good movies at least. The writer (Seth M. Sherwood) of the horror classic Leatherface — sarcasm— wrote Hell Fest along with a bunch of people who don’t have IMDb pages. Slasher movies are back, maybe. There’s a lot of hype surrounding the new Halloween, rightfully so it looks awesome and Hell Fest looks like it’s trying to capitalize on that plus Halloween the holiday is around the corner. This was a generic slasher movie with a 2018 spin. The most interesting aspect of the film was the setting. A haunted theme park with a murderer seems totally possible currently and is something I haven’t seen in film before. The setting really added to the tension of being stalked, you didn’t know when it was a real threat or not. The director could’ve relied heavily on jump scares because of the setting but did not so kudos for that but it wasn’t super scary so maybe those would’ve helped. The killer had shades of Michael Myers and Jason Voorhees in him — he was a random stabby guy. He did have two satisfying and gory kills, so I applaud that. Another thing this movie did right was the characters, they were one dimensional, but I found myself rooting for them — they weren’t there to just get murdered — but they totally were. The dialogue between the teens was some of the most authentic dialogue for teens I’ve heard in a movie — they spoke like real teenagers. Overall this is a rather forgettable slasher movie, with that being said I had fun with it. I wasn’t expecting much, and it delivered enough. I wanted to see teens getting killed and that’s what I got — a paint by numbers slasher movie. This isn’t a must see but if you need a slasher fix before Halloween comes out this will do the job. Plus, the Candyman himself, Tony Todd was the voice of the park. 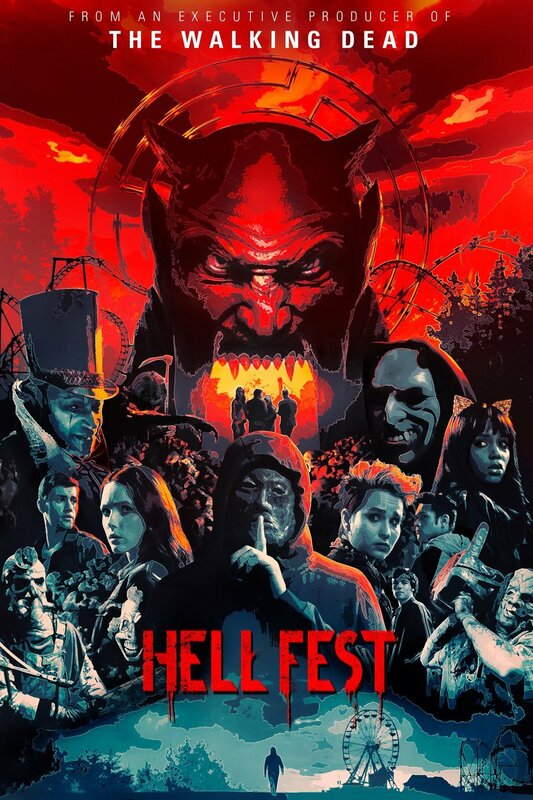 I give Hell Fest a 6 out of 10, would watch again.